Joe Namath, the New York Jets legend, conducted the coin toss to begin Super Bowl XLVIII while wearing a fur overcoat. Namath has a flamboyant reputation, and many observers found the coat well within the Hall of Fame quarterback’s larger-than-life persona. Of course, the humorless animal-liberationist scolds at People for the Ethical Treatment of Animals (PETA) didn’t, Tweeting complaints and demanding he “consider FAUX.” (Don’t tell them the footballs are made of leather.) If PETA wants people to respect animals, maybe they shouldn’t kill a staggering proportion of the dogs and cats that enter PETA’s animal shelter every year. Weirdly, if Namath had been a certified PETA ally, he might have gotten away without a shot from the organization’s scolding division. Numerous PETA-backing celebrities have admitted to (or been caught) breaking the group’s radical animal liberation taboos, with few repercussions. As more people become aware of PETA’s shameful hypocrisy and radical agenda, more and more celebrities are standing openly against it. In the spirit of Broadway Joe himself, we can “guarantee” that PETA’s influence will continue to decline. 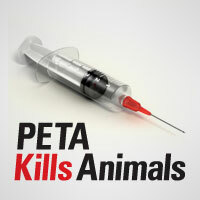 We will continue to expose PETA for its hypocrisy and extremism. Head over to Petakillsanimals.com to see the full, graphic truth—if you can stomach it.